Time really flies so fast and today we’re hitting our 10th year anniversary as a couple. If you have been reading this blog for quite some time now, you’re aware that February is our BF-GF anniversary. I said “yes” 10 years ago and I said “yes, I do” 7 years ago at the same place which is Intramuros. Whenever people asked us where we met, we always say “UST” because we’re both alumni of UST but the truth is we met on an island. We’re both members of Haribon-UST now EARTH-UST but we never ever crossed our path for one whole year. Whenever I attended an event he was not there and whenever he attended an event I was not present. Summer of 2002, we both attended leadership training seminar of Haribon-UST in San Salvador Island. It is a protected island in Zambales. That was our first meeting but it was not a love at first sight, we didn’t mind each other and we have our own set of friends. Even in school, we never crossed our path because we have different courses, schedules and buildings. He was in Engineering building and I was in Commerce building, he always stays in the library and I don’t go there. The only time that we see each other is when we have organization meeting because we’re both officers of Haribon-UST. We became friends then lovers and the rest is already a history. A few days from now we will be celebrating our 7th year wedding anniversary. I don’t know what will be the celebration because my son is still sick and we have no travel plans this year. Last February 2012, I’ve made a promise that I will not book any trip even there’s a seat sale and even I had expiring miles last year, I did not book any flight. Anyway, it is just less than 2000 miles. When January 2013 came, I felt so bored because I was not planning any trip and I told hubby that my son wanted to go to Legoland. My son is now into lego and he saw the pictures while I was reading a blog post. But my husband declared a travel ban this year, waah! He said no travel outside Luzon. Hmm, so pwede Tuguegarao, Palawan, Naga and Legazpi trip. He said no travel via plane. I’m grateful to God for giving us ten wonderful years and I’m praying that there will be more years to come. I thank God for blessing me much more than I deserve and I could not ask for more. 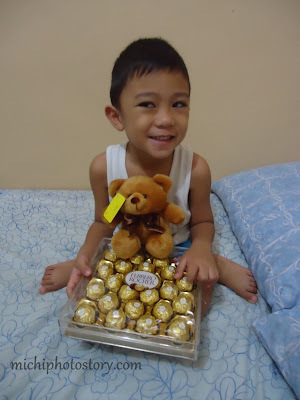 And finally, he remembered that I dislike flowers so he gave me this, chocolate for me and bear for my son. Happy anniversary to both of you, Michi! May you have more blessings and happiness in this lifetime. natawa naman ako.... parang pareho tayo ng wish for them : May you have more blessings and happiness in this lifetime. hahaha! inspired sa kin kaya nag top 1. hehe! =) thanks!